I’m lucky to live so close to a place many people dream of visiting – the beautiful historic city of London, England. There are so many things to see and do here, and it’s also a wonderful place to eat. Here are my current top ten London restaurants, my favourite places to enjoy what I think is some of the best food in London. A wonderful place for a very special meal, Le Gavroche has been delighting London diners for over forty years. Michel Roux Jr., the son and nephew of the founders, is now at the helm of this iconic restaurant, the opening of which was attended by Charlie Chaplin, Ava Gardner and Robert Redford. My husband and I celebrated our twentieth wedding anniversary at this Michelin starred restaurant two years ago. It was a fantastic experience – the service is second to none and the food is absolutely amazing. Unlike many restaurants with a famous chef at the helm, Michel Roux Jr. actually cooks here. In fact, he came to our table after dinner to ask if we had enjoyed our meal. Yes, it is eye wateringly expensive but totally worth it. To sample the experience without completely breaking the bank, visit Le Gavroche for lunch. The Business Lunch Menu is priced at just over £50 per person. Dress is smart casual, but I definitely suggest erring on the side of smart. Men are requested to wear a jacket/blazer. Booking well in advance is essential. An incredibly historic restaurant in the heart of Piccadilly Circus, The Criterion is the place where Arthur Conan Doyle set Sherlock Holmes and Dr Watson’s first dinner together. In real life, it has been visited by politicians, statesmen and many a Hollywood star. The decor is colourful and opulent. In fact, it’s worth visiting for the beautiful interior alone. The food is excellent too. At a much more moderate price point than Le Gavroche, a main course here will generally cost between £16 and £30 depending on what you order. There’s something for everyone with lots of variety on a menu that changes with the seasons. 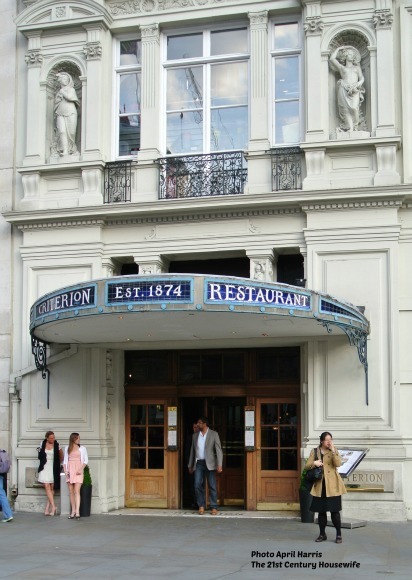 It’s a great place for a pre or post -theatre supper as it is on the edge of the theatre district, with The Criterion Theatre right next door. 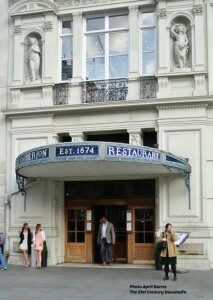 The Criterion is a family favourite and we go there at least four times a year. I recommend booking in advance to avoid disappointment. Dress is smart casual. I have so many lovely memories of Afternoon Tea at The Palm Court at The Ritz. In my opinion, it’s one of the best places in London for a proper Afternoon Tea. 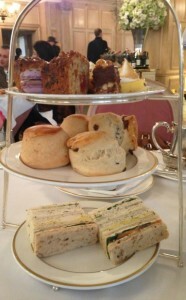 The ambiance of The Ritz is simply second to none, and Afternoon Tea is one of the most frugal ways to experience it. A traditional tea will set you back £45 per head (£57 with a glass of champagne), however it includes a choice of 17 different kinds of tea and also a great many lovely things to eat. Finger sandwiches are followed by warm scones with jam and clotted cream. Then come the beautiful cakes and petit fours, tiny mouthfuls of gorgeousness to end the meal. If one of your party is celebrating a birthday, consider the birthday tea at £56 per head. This includes a small birthday cake, and a rather lovely piano serenade of ‘Happy Birthday’. Dress is formal. Men must wear jacket and tie. Jeans and sports shoes are not allowed. Ladies may wear smart trousers, but honestly you will feel more comfortable in a skirt or dress. Reservations fill up months in advance, so do reserve online well before you hope to visit. As it is situated right in the heart of London’s West End, The Ivy is the perfect place for pre or post theatre dining. The atmosphere is buzzing and you never know who you will spot. 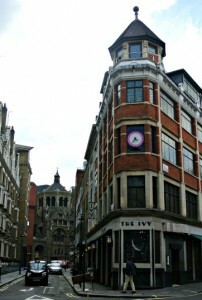 Its proximity to the theatres means the Ivy is very popular with actors and the glittterati alike. There is a three course set menu at around £26 and an excellent à la carte menu as well as a good wine list at nearly all price points. The service is wonderful. My family and I often celebrate birthdays here, and as you can see, the staff at The Ivy take care to make them very special indeed. Dress is smart casual. Be sure to book well in advance of your planned visit. The first thing you are likely to notice on entering The Georgian Restaurant is the gorgeous grand piano, which is played regularly. The surroundings are elegant and the atmosphere is relaxed but refined. I’ve eaten here on several occasions over the years, both lunches and afternoon teas, and have always enjoyed the experience. The Georgian Restaurant offers a delicious lunch buffet, starting with hors d’hoeuvres, then main courses and finally gorgeous patisserie style desserts. There is also an excellent à la carte menu. Afternoon Tea is also wonderful here, and very reasonable at £36 per person. Once you have chosen from the huge array of teas, a beautiful three tier tea tray is brought to your table with finger sandwiches, scones served with clotted cream, rose petal jelly and strawberry preserves, and a lovely selection of tiny cakes, tarts and pastries. Dress smart casual. Reserve ahead to avoid disappointment, particularly for afternoon tea. Just a few minutes walk from Kensington Palace, Kitchen W8 is a wonderful place for lunch or dinner. A fresh, innovative menu and consistently delicious food are hallmarks of this popular restaurant. Recently awarded a Michelin star, Kitchen W8 aims to be a ‘home from home’ and the atmosphere is casual but elegant. Dishes are beautifully presented with great attention to detail. I like the fact the menu changes seasonally and there is always something new to try. Visit early in the evening (between 6 and 7pm) to take advantage of their fixed price set menu. Two courses cost £21 and three courses £25. There is also a three course Sunday lunch menu priced just under £30. These are excellent prices, particularly in this popular area. Dress is smart casual. Again this restaurant is very popular with the locals so do book in advance. The Northall is situated near Downing Street in one of my favourite London hotels, The Corinthia. The building dates back to 1885 and the restaurant is architecturally gorgeous, with beautiful arched windows and an amazing ceiling. Bright and airy, the atmosphere is refined but comfortable and the food is outstanding. Friendly staff and excellent food make this restaurant an absolute delight. The Northall offers a ‘Theatre Menu’ from 5.30 – 7pm and 9.30 to 11pm. A glass of champagne and a three course meal cost £30 per person. Side dishes (potatoes and vegetables) are extra, priced at £3.50 each, but each side is enough to share between two people. For the location, this is incredible value. The à la carte menu is more expensive, but well worth the indulgence. Dress is smart casual. We have made reservations at very short notice in the past, but booking in advance is recommended. Situated just behind Regent Street in the Heddon Street ‘Food Quarter’, The Living Room W1 is very conveniently located if you are shopping or sightseeing in London’s West End. Particularly good at traditional English dishes, The Living Room’s fish and chips and meat pies are fantastic, but they also offer more modern British fusion dishes as well. The menu changes seasonally and there are lots of dishes to choose from as well as a good wine list featuring lots of wines by the glass. A great place for lunch or dinner, my family and I often dine here. Dress is casual. Reservations are recommended, particularly for dinner. Just across the road from Harrods, Zia Theresa is a bistro style restaurant serving delicious freshly cooked Italian dishes. There’s a great relaxed atmosphere and the food is really delicious. I particularly like their Grilled Seasonal Vegetables with olive oil and their Parma Ham and Melon is divine. They also do a delicious Veal Milanese. There is a good wine list featuring Italian wines at all price points. There’s no real dress code. This is a place the locals frequent and love. Booking in advance is a good idea as Zia Theresa is very popular. Featuring a 29 metre long bar and fabulous architecture, The Booking Office Restaurant and Bar is part of the recently refurbished Renaissance London Hotel at the iconic Kings Cross/St Pancras Station. It is actually the booking office from the original St Pancras Station built in the Victorian era. We were passing by one evening not too long ago and popped in. Although we did not have a reservation we were seated immediately. Serving a traditional English menu from breakfast to tea time and evening meal, The Booking Office’s menu does reflect modern tastes and offers a great selection of dishes. They also serve excellent cocktails! Dress code is casual. Booking is recommended but not essential. While London may not have been considered a ‘foodie’ destination in the past, now it is a hotbed of innovative and exciting cuisine. Whether you live nearby or are visiting London for business or pleasure, there are certainly plenty of wonderful places to eat. This post is part of the Social Fabric Local Restaurants Blog Hop. The opinions in this post are based on my own personal experience of each of the restaurants mentioned. This is not a sponsored post. I’ve only been to one of these – tea the Ritz – and that was yeeearrs ago when it felt super-expensive but certainly wasn’t £45! I love the mix of styles and price points you included here; I’ll definitely be saving this for future reference. That’s what’s great about London, is that even expensive places quite often do set menus, giving more people chance to experience it. I love London, it’s one of my favorite places to visit. I will keep this list for my next visit! 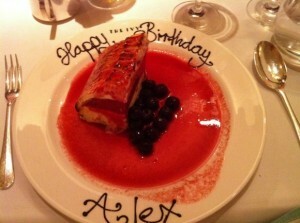 I visited Le Gavroche a few years back and found it to be exemplary. I’ll defiantly be visiting there again when I’m in London at the end of the Month. I loved afternoon tea at the Ritz London. I’ll be pinning this for more places to try on our next trip to London. 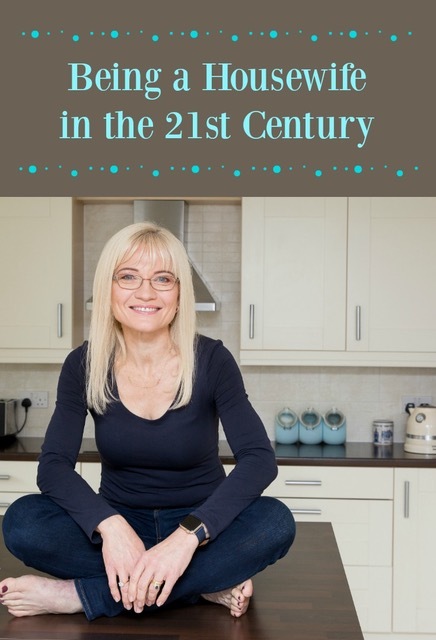 At last, a common-sense guide, well written and hugely informative. This is my guide from today, great reading, thank you. Thank you so much, John! I’m so glad you like it. Great restaurant tips. Would like to follow, please add me.